Cytisine is a nicotinic acetylcholine receptor agonist. 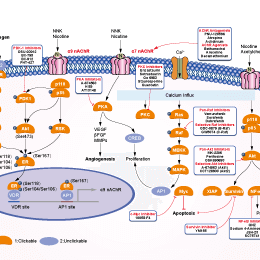 AZD3839 is a potent and selective BACE1 inhibitor with Ki of 26.1 nM, about 14-fold selectivity over BACE2. Phase 1. Xanthohumol, a prenylated chalcone from hop, inhibits COX-1 and COX-2 activity and shows chemopreventive effects. Phase 1. 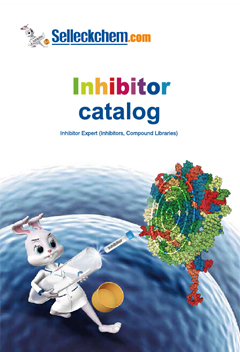 A-438079 HCl is a potent, and selective P2X7 receptor antagonist with pIC50 of 6.9. PNU-120596 is a positive allosteric modulator of α7 nAChR with EC50 of 216 nM. Darifenacin is a selective M3 muscarinic receptor antagonist with pKi of 8.9. Atropine sulfate monohydrate is a competitive antagonist for the muscarinic acetylcholine receptor, used to decrease the production of saliva and secretions of the airway prior to surgery. Donepezil is a specific and potent AChE inhibitor for bAChE and hAChE with IC50 of 8.12 nM and 11.6 nM , respectively. Galanthamine is an AChE inhibitor with IC50 of 0.35 μM, exhibits 50-fold selectivity against butyryl-cholinesterase.